Isotope Ratio Mass Spectrometry (IRMS) finds increasing use in ever expanding and diverse fields, such as forensic, biological and geo-sciences. As a result, instruments find their way into laboratories often unfamiliar with the idiosyncrasies of the technique. The application of IRMS relies on the precise measurement of the relative abundance of ions in the mass spectrum of simple gaseous species. An inexperienced laboratory may obtain results that appear precise and self-consistent but which do not reflect the samples that were analysed and cannot be compared directly to those from other laboratories. Interpretations based on such data may, at best, be misleading. This guide aims to provide an in-depth understanding of the many and diverse processes involved in generating IRMS data, the quality control of these data and in their interpretation. Chapters cover topics such as, instrument set-up, calibration, making measurements, data handling and uncertainty, quality assurance and troubleshooting. The guide was produced by members of the Forensic Isotope Ratio Mass Spectrometry (FIRMS) Network and with support from the UK National Measurement System. If you have any comments please contact the FIRMS Network via gpg@forensic-isotopes.org. Editors – Dunn P. J. H.; Carter J. F.
Citation - Dunn P. J. H. and J. F. Carter, eds. 2018. 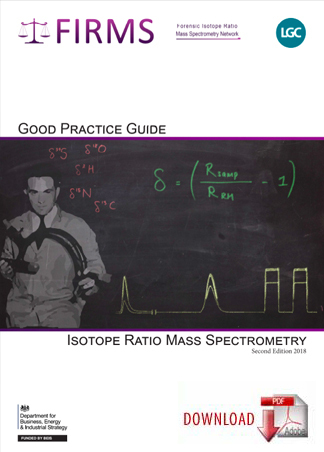 Good practice guide for isotope ratio mass spectrometry, 2nd Edition. Please donate to FIRMS to support the development of this important resource.